Many of the most exciting and dramatic changes to how we lead our lives have, in recent years, come about as the result of technology. Digital technology, in particular, now appears to have a major influence on almost every aspect of our lives, and even more so on the lives of children and young people. Their understanding of the world, including their expectations and ambitions, are almost unrecognizable even from a single generation ago, and much of this is to do with their continued exposure to technology. The world of education is no exception. The best classrooms fully exploit the available technology to help prepare young people for the world ahead of them, enhancing the learning experience to its fullest extent. Learning does not begin and end in the classroom. In fact, some of the most exciting school experiences take place outside of the school building itself, with field trips providing for many people some of their most memorable educational moments. Sadly, budget cuts and a range of other factors, including the difficulty of logistics and an enhanced focus on health and safety in recent years, have made it increasingly challenging to arrange school trips. The best teachers fully understand, however, just how important such trips are to inspire young minds, and they are continually seeking new ways to overcome these challenges and ensure their classes enjoy the opportunities they want and deserve. Research - modern technology means that people have access to information in a way they have never had before. The Internet allows everyone to view locations and venues on the other side of the world with an astonishing level of accuracy. Potential trip destinations, from hotels to museums, can be researched in great detail before even stepping out of the classroom. There is also a range of independent review websites for just about every aspect of a trip; these can provide honest feedback about what a place is really like. Price comparison - taking this access to information one step further means being able to ensure the best value for money from such a trip, which is an incredibly important consideration when budgets are tight. By booking travel and transport as well as accommodation in advance through price comparison websites, one can be sure of getting the best possible deal. Itineraries can also be worked out in great detail, with teachers being able to get Philadelphia Eagles tickets events, for example, at the best possible price. Safety considerations - the Internet also provides instant access to a comprehensive range of information and advice with regard to safety. Everything from hints and tips about how to keep a group of young people safe in a particular area or location through to international law can be properly researched and discussed with fellow educational professionals to ensure that preparations are made for the safest possible trip. The use of technology does not have to stop in the classroom, nor at the preparatory stage of a school trip. Teachers and other coordinators can also use technology while on the trip itself in order to fully maximize the experience. 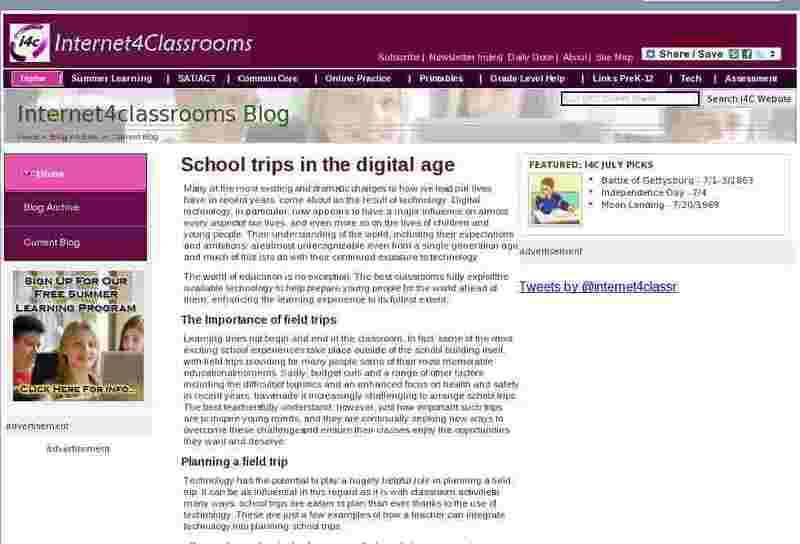 Learning on the go - smartphones and tablets that provide immediate access to the internet mean that teachers are never more than a few clicks away from the answer to any question, however challenging and specific it might be. Being able to look up information about a location while standing in that very spot is a brilliant way of bringing such a place to life for students. Maintaining records - school trips require a great deal of administration and paperwork. Previously, this potentially meant carrying around a lot of heavy files and trying to keep track of it all, which is not an easy thing to do while on the move. Today, through the utilization of mobile technology, all this information can be stored securely on a device small and light enough to fit in one's pocket. Keeping in contact - there are a range of applications now that allow items, or even people, to be tagged so that their location can be monitored. Such technology can prove invaluable on a school trip, which invariably involves responsibility for a range of young people in potentially hazardous environments. It also provides a means of connection with concerned parents and the school itself, adding an extra layer of safety and security. Virtual school trips are enjoying an increased interest thanks to the ease and simplicity with which they can be carried out. Not only do they require minimal amounts of planning and virtually nothing in the way of funding compared to a regular school trip, they can also be carried out within the comfort and security of a classroom and, if managed carefully, still provide a fun and inspirational educational experience. Some commentators claim that such activity is a poor substitute for experiencing things in the real world, but it cannot be denied that given the restrictions teachers face today when trying to plan a school trip, such an approach does have many notable advantages. Whether it is at home, at school, or enjoying an activity away from the classroom, technology has an important role to play in enhancing educational experiences to make them as enjoyable and memorable as possible. In this day and age, when it would appear that arranging a school trip is a bigger challenge than ever, in reality, all it takes is a bit of research into the technological options involved, combined with some imagination and ambition, to ensure that children can have the experiences they really deserve.